On Saturday morning, Drew and I went to go pick out our Christmas tree. Due to a 10K going on at the same time, a lot of streets were closed off—including the route we were planning to take. Driving up and down a few side streets, we managed to find another tree nursery. As we walked up and down the rows of trees, most were clearly too big, too crooked, or too sparse. I pointed to one that I thought was the perfect height and width, but it leaned a little too far right. Drew noticed that it was propped up against the fence on a tilt, so it actually was just perfect. Roping it to the top of Drew’s car, we headed to the store in search of lights. 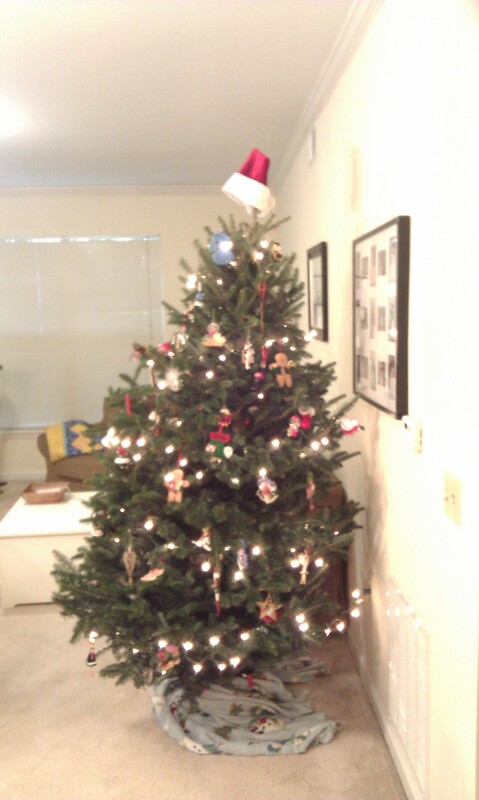 After schlepping the tree through the garage and into our apartment, we planted it next to the couch. There was already a path of pine needles leading from the front door. That’s the price you pay for getting a real tree, and we’ll be putting our vacuum to good use this month for sure! The festive pine scent that greets you when you walk in the door is more than worth it though. After stringing the white lights and plugging them in, we noticed that every fifth light twinkled on and off. In a way, it made the entire tree look like it was sparkling-very magical! We hung up our ornaments while watching the UK/UNC game. It was a nail biter until the very end and we had to keep taking breaks from decorating to sit down and catch the game. Once the game ended (Wildcats won!) we finished decorating the tree. Going through the dozens of ornaments from Drew’s childhood was a real treat for me-there were quite a few that really made me smile. We also found an extra-special ornament we’d forgotten about–a keepsake where a charm for each year is added to the bottom. 25 years from now, if we’re still adding charms, that will be one of our most special ornaments! Toward the end we noticed that we didn’t have a tree topper. Half jokingly, I grabbed a red Santa hat and set it on top, thinking it could be a temporary topper until we found a more suitable angel or star. But we quickly came to love it-it’s quirky, unique, and very much a “our first Christmas” accessory. I’m sure by next year we’ll have a more traditional topper, but for this year, the Santa hat stays! Love it! I have a Precious Moments Angel topper I had planned to bring when I came down to Georgia for Thanksgiving and forgot it. But, it is here with a couple other small items for you to take home and use next year!! Sorry, I forgot. Your first tree will always be a treasured memory. PS I love the Santa hat as a topper. I have done that myself a couple of Christmases and I had other toppers.